Michigan matched its best start since 2015 (10-0) with its 10th straight sweep to open the season. Both teams struggled offensively in the first two sets, failing to reach a .150 efficiency, but Michigan turned it around in the third stanza, outhitting the Fighting Irish .441 to .194. In the end, the Wolverines outdid Notre Dame .223 to .108 in the hitting department, while boasting a 42-31 advantage in kills and 5-2 edge in aces. The Fighting Irish won the block (9-5). Freshman Paige Jones led the Wolverines offensively for the second straight match, racking up 13 kills at a team-best .308 hitting percentage. She finished off a double-double with 10 digs. Carly Skjodt also managed a double-double with 12 putaways and 10 saves. Sydney Wetterstrom rounded out the offense with 10 kills. MacKenzi Welsh turned in a double-double of her own with 32 assists, 10 digs and a team-leading four blocks. The four double-doubles marked a first for Michigan since 2016. Charley Niego and Jemma Yeadon led the way for the Irish with nine and eight kills respectively. Niego also added nine digs and two blocks. Hannah Thompson posted a match-high five blocks and four putaways. Ryann DeJarld was tops on defense with a match-leading 19 digs. Notre Dame surged ahead 12-5 in Set 1 with help from four blocks, putting Michigan’s sweep streak in jeopardy. Later, trailing 17-11, The Wolverines began to chip away, eventually outscoring the Irish 9-2 to take a 20-19 lead of their own. Four different players notched kills and the team added two blocks, forcing Notre Dame to use both of its timeouts. A Niego kill and Sydney Bent ace put the Irish back on top 21-20. 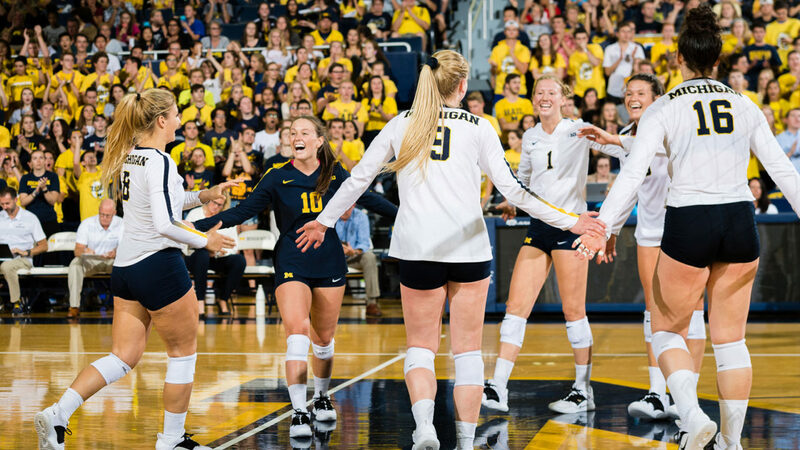 Michigan finished off the comeback with a 5-1 run, capped by back-to-back kills by Jones. Set 2 featured eight ties, the last at 16, as neither side led by more than three early on. From there, it was nearly all Wolverines. Two kills by Skjodt and two by Wetterstrom highlighted a final 9-1 rally. An Irish hitting miscue clinched the 25-17 win. The teams traded blows in Set 3 leading to a tie at 12-all. Michigan built a four-point lead at 19-15 behind three Skjodt putaways. A Yeadon kill made it a three-point game at 19-16, but against the Wolverines had the final push. Jones and Wetterstrom downed two kills apiece to make it 23-16. Another Wetterstrom termination put Michigan on the hill at 24-17. A service error prolonged the inevitable before Jones issued the final blow at 25-18. The Wolverines and Irish will face off again on Sunday, this time in South Bend, Indiana, where Michigan will look to finish off a perfect non-conference slate.